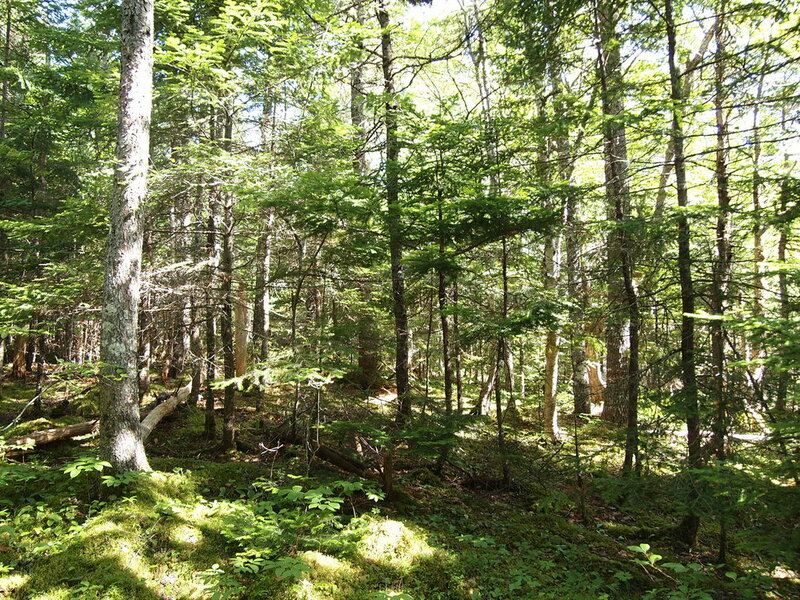 Near the charming village of St. Peter’s is this lovely 10 acre wooded parcel of land offered for sale in Grand Anse. Great access with electricity and phone service. Several cottages and homes in the area. Road front and access along Highway 4 and the Back Route Road. Steps away from freshwater lakes, Lennox Passage, Atlantic Ocean, fine fishing, clam digging, boating. Location: Grand Anse, Route 4, Richmond County, Cape Breton, Nova Scotia. Here is a great bird's eye view, looking in an easterly direction, of the land. 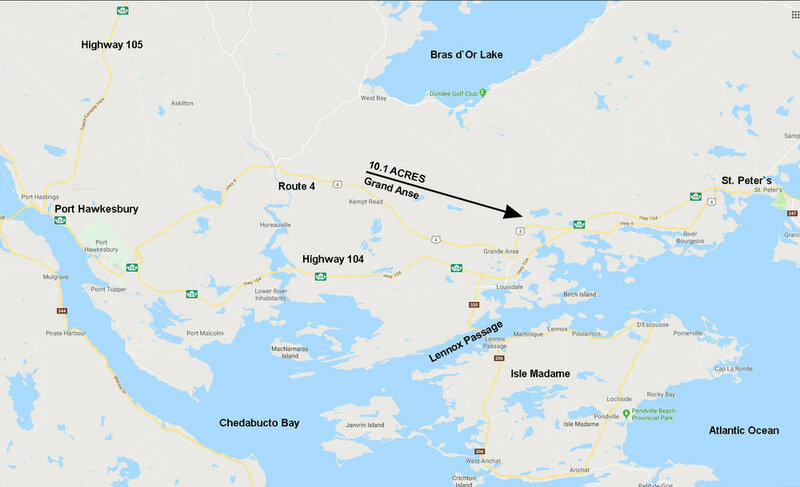 You can see nearby lakes and McLeans Cove which connects out to McLeans Cove and Lennox Passage (Atlantic Ocean). 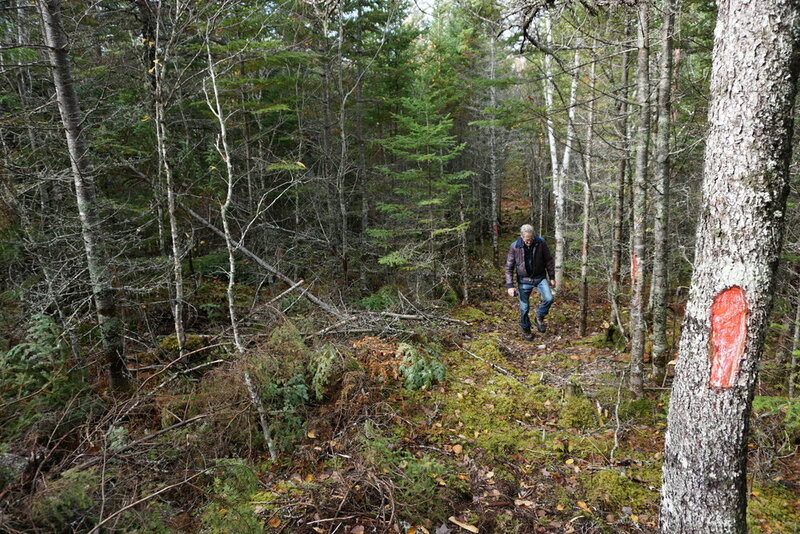 Looking in a northerly direction showing the approximate boundaries of the 10 acre property in Grand Anse, which has great frontage along Route 4 (Fleur-de-Lis Trail) and the Old Route 4 highway. This picture was taken from road side along Route 4 (Fleur-de-Lis Trail) looking into the 10 acre property. 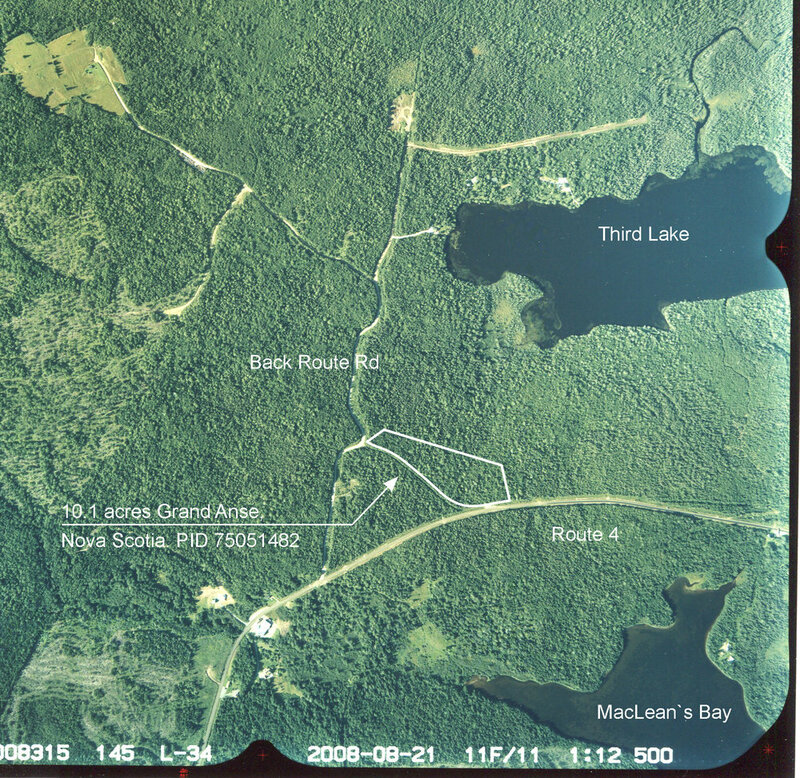 Back Route Road at Route 4 (Fleur-de-Lis Trail) which leads to the property as well as Third Lake and a small development around the lake. This picture was taken within the 10 acre property. 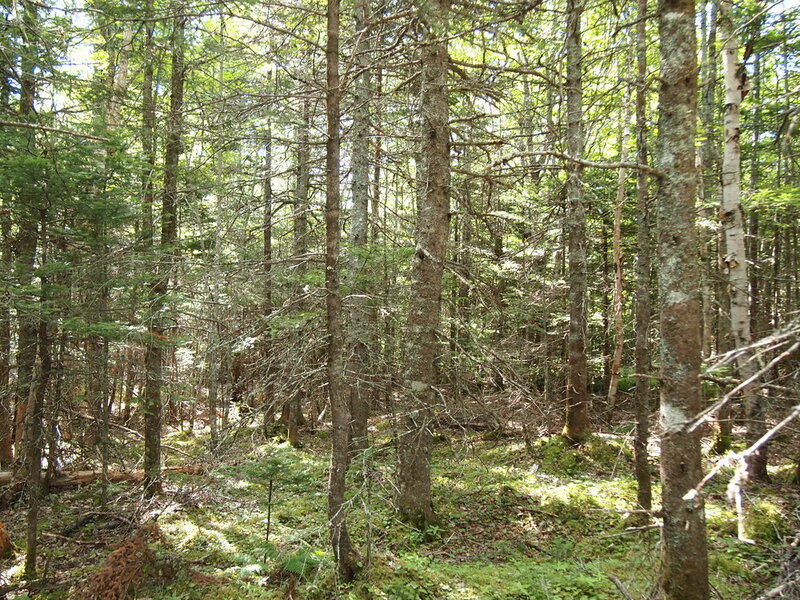 As you can see the land is treed in evergreen and deciduous trees such as fir, spruce, birch and maple. Here is another picture taken within the 10 acre property. This picture was taken along the Old Route 4, which is no longer in use and has grown in over the years. This picture was taken along the property line of the 10 acre property, near Route 4. 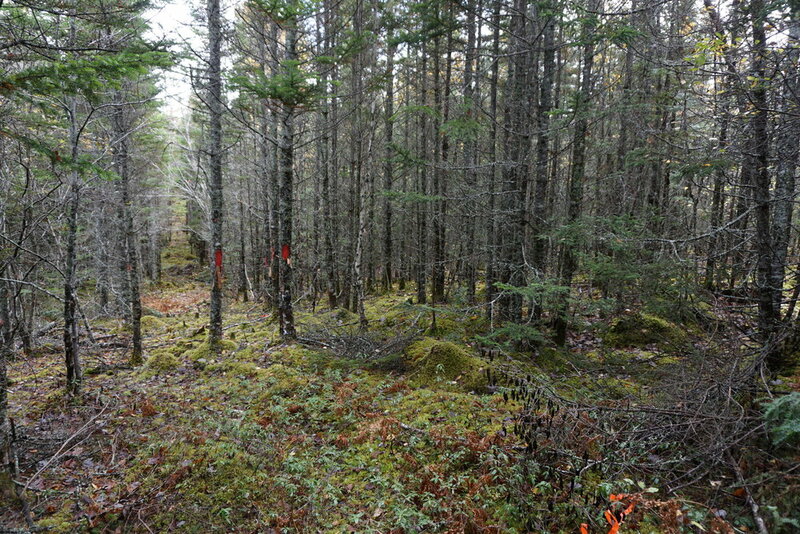 Another picture taken within the 10 acres along the freshly marked property line. Just 10 minutes up the road via Route 4 (Fleur-de-Lis Trail) is the lovely community of St. Peter's and the St. Peter's Marina on the Bras d'Or Lakes. From St. Peter's you have access to the Bras d'Or lakes as well as the Atlantic Ocean. Mackerel fishing in the area is excellent! 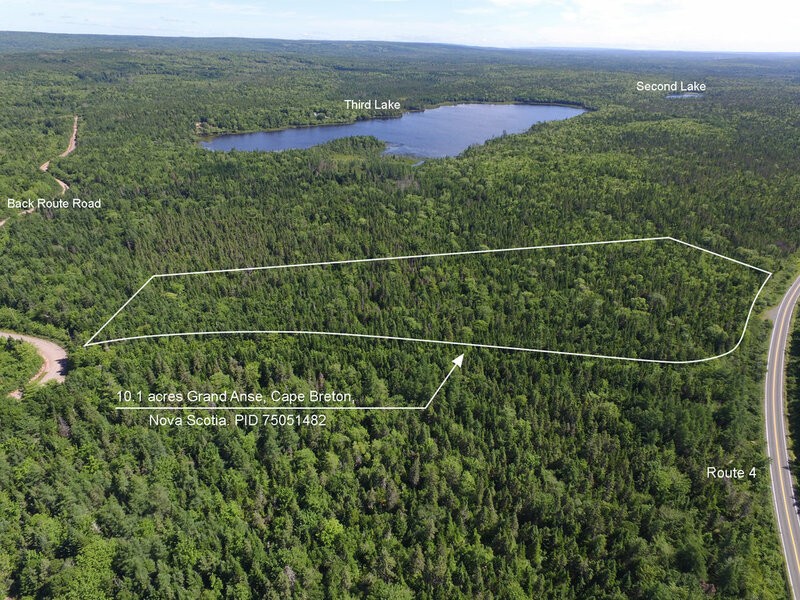 Here is an aerial photograph outlining the 10 acre property. A topographic map showing the location of the 10 acres in Grand Anse. 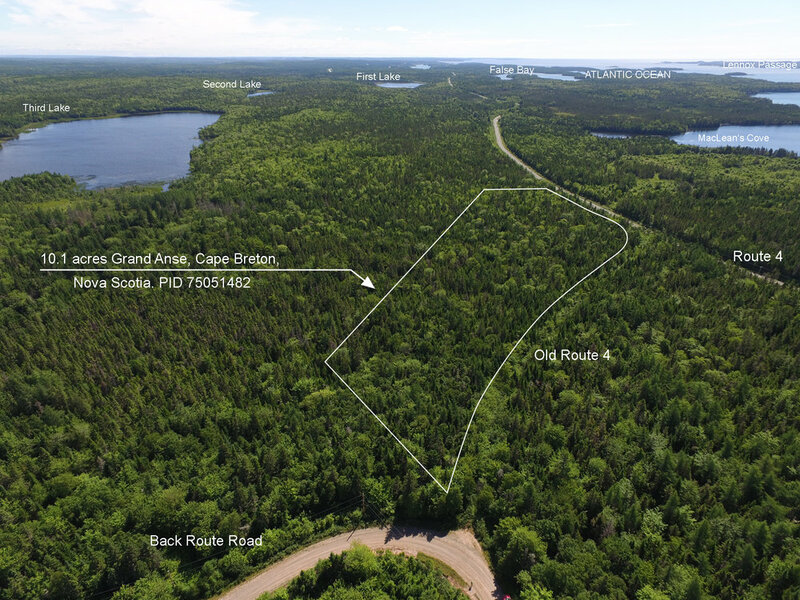 The community of Louisdale is just a few minutes south of the property and the community of St. Peter's is about 10 minutes to the East via Route 4 (Fleur-de-Lis Trail). Here is a map indicating the location of your 10 acres and highlighting the nearby communities and landmarks in the area. The Town of Port Hawkesbury has all amenities and is just 20 minutes to the West via Rotue 4 or Highway 104. 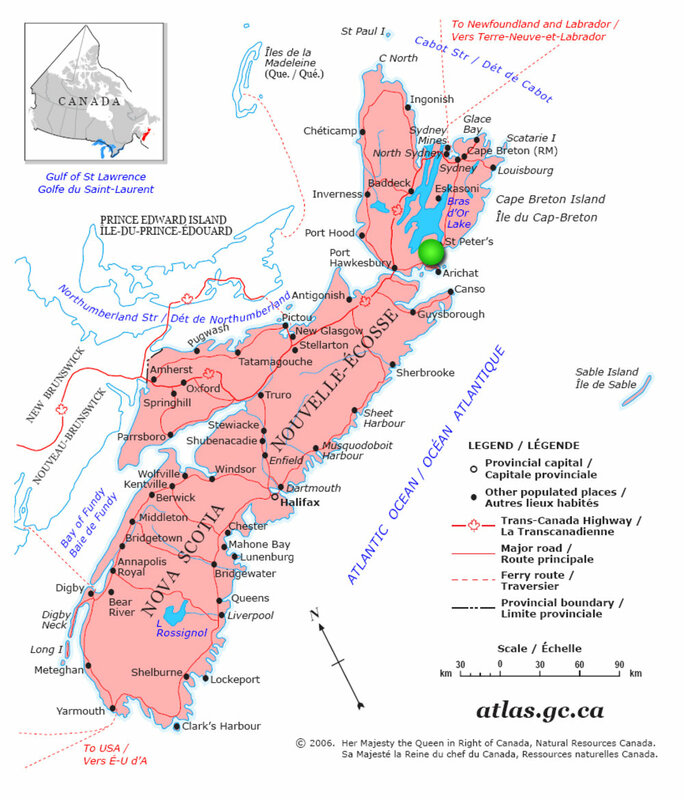 Here is a map of Nova Scotia showing the location of the property (green dot). 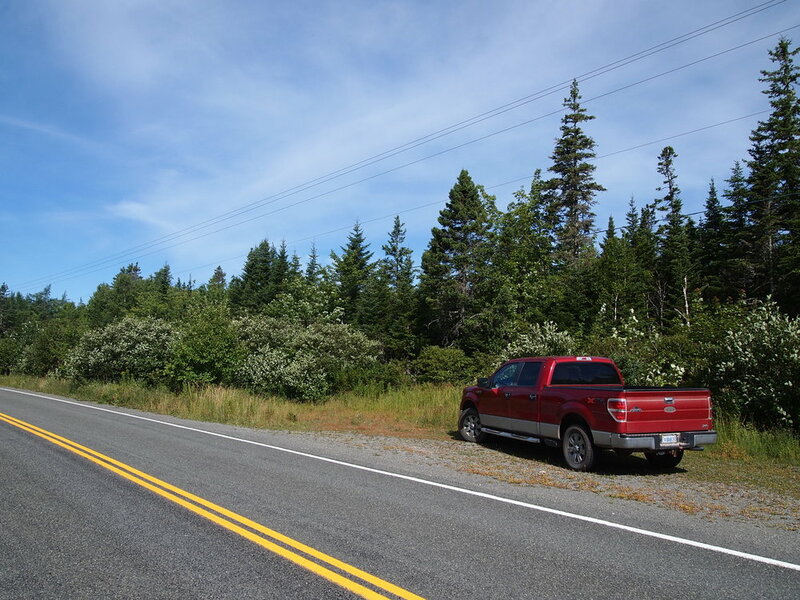 Land situated along Back Route Road and Route 4 in Grand Anse, in the County of Richmond and Province of Nova Scotia, CANADA. - 1530 feet (466 meters) of road front along the Old Route 4. - Approximately 496 feet (151 meters) of road front along Route 4 (Highway 4). - Access via Back Route Road. - Electricity and phone available to service a home or cottage. - Property boundary lines were recently marked and opened up. - Well treed piece of land suitable. - Nearby summer homes and cottages. - Closeby Third Lake via Back Route Road and Trout Lake Drive. - Closeby the Lennox Passage and shoreline – Atlantic Ocean. - The friendly town of Louisdale is just 5 minutes from your land – Post Office, Gas, Groceries, services. - Just 10 minutes from the larger town of St. Peters with Post Office, Bank, Marina, Canal between the Bras d’Or Lakes and the Atlantic Ocean. - About 15 minutes from the regional hospital in Evanston. This 10.1 acre parcel of land, with great all-season access lies along the Fleur de Lis Trail (Route 4) in the community of Grand Anse, just minutes drive from the seaside towns of Louisdale and Saint Peter’s. Topography of the land is level to gently sloping from roadside, and is approximately 20 meters (65 feet) above sea level. The land is densely wooded throughout in evergreen tree species – Fir and Spruce, and deciduous tree species – Maple and Birch. The land also borders the Old Route 4 roadway which over the years has grown back to become a trail of sorts. 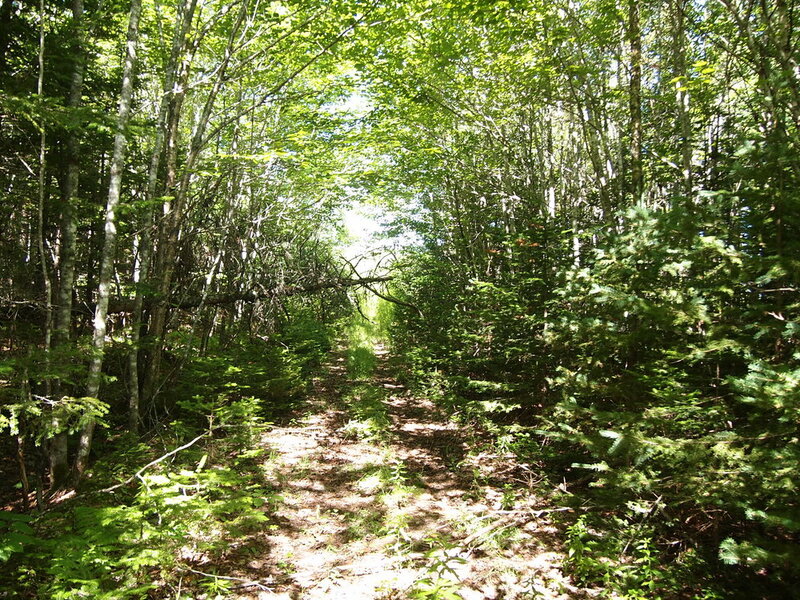 The road can be opened up again to be used as an access to enter onto your land. There are many suitable sites for a cabin or home on the 10 acres. Just a minute up the road from your land is Third Lake – a lightly developed freshwater lake with three or four cottages and homes along the shore. 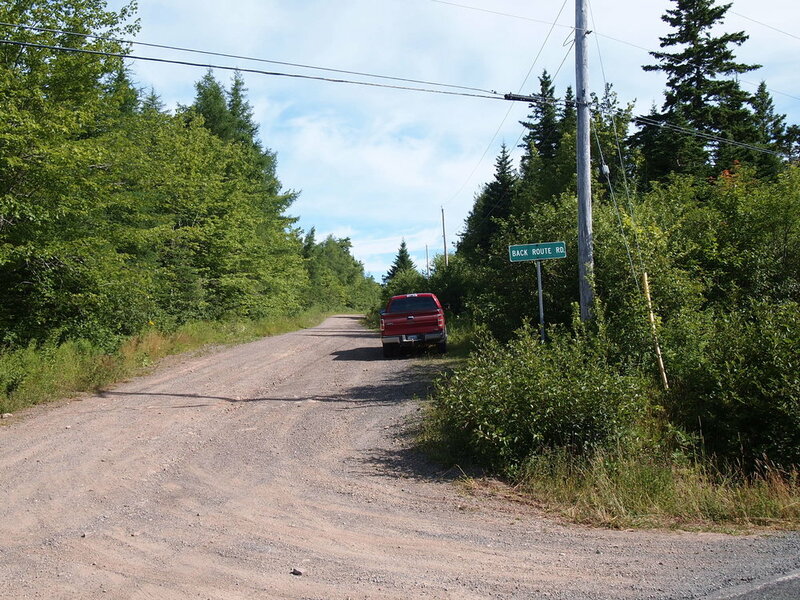 Following the Back Route Road beyond the lake will get you into remote backroad trails and crown lands within Sporting Mountain. A 5 minute drive south will take you into the community of Louisdale, offering most services and amenities. Just a few miles from Louisdale at Evanston is the Strait Richmond Hospital. 10 minutes to the west and you will reach Saint Peter’s – a charming community which offers all amenities, including groceries, gas, post office, restaurants, marina, home improvement store, Tim Horton’s, banking, and weekend markets. St. Peter’s also has a bustling marina on Bras d’Or Lakes and the St. Peter’s Canal linking the Atlantic Ocean to Bras d’Or Lakes. The canal is a great spot to enjoy the sailboats and yachts entering the Bras d’Or Lake and for Mackerel and Squid fishing. 20 minutes drive west from your land will take you to the full-service town of Port Hawkesbury offering many business services, Walmart, Canadian SuperStore, Sobeys, Canadian Tire, numerous hotels, restaurants, grocery shopping, banks, post office, schools, government office, community civic center. The Atlantic coastline and superb beaches are close by. 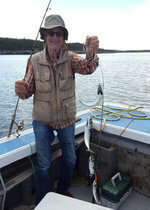 Ocean fishing for mackerel, cod, flounder is excellent. Cape Breton’s best surf and nicest stretch of sand beach is at Point Michaud Beach, just 25 minutes away. Fresh fish, lobster and crab can be purchased directly from the community fisherman wharfs in L’ardoise and on Isle Madame. The breathtaking Bras d’Or Lakes, Canada’s largest in-land sea, is also just 10 kilometers (6 miles) from your property. 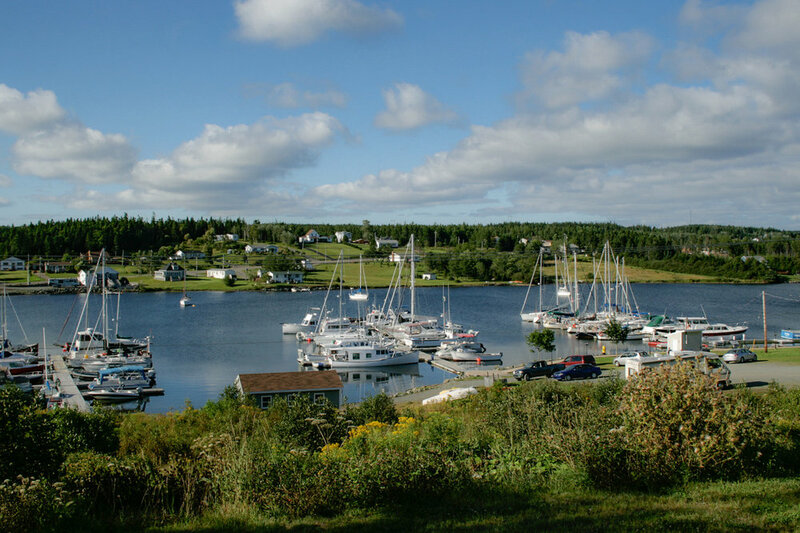 Known for it’s virtually fog free waters, the Bras d’Or Lakes are ideal for sailing, boating, and fishing. While out on the water, you’ll likely see wildlife roaming the shores, and may even see bald eagles flying overhead. In June 2011, the UN declared the Bras d’Or a Biosphere reserve, identifying it as a place where people live in harmony with nature. • Freshwater lakes and rivers ideal for fishing – Third Lake, Second Lake, First Lake, Buchanan Lake, and more! • Ocean water for boating and fishing – Grand Anse, MacLean’s Cove, Lennox Passage, River Bourgeois, False Bay, St. Peter’s Bay and the Atlantic Ocean! 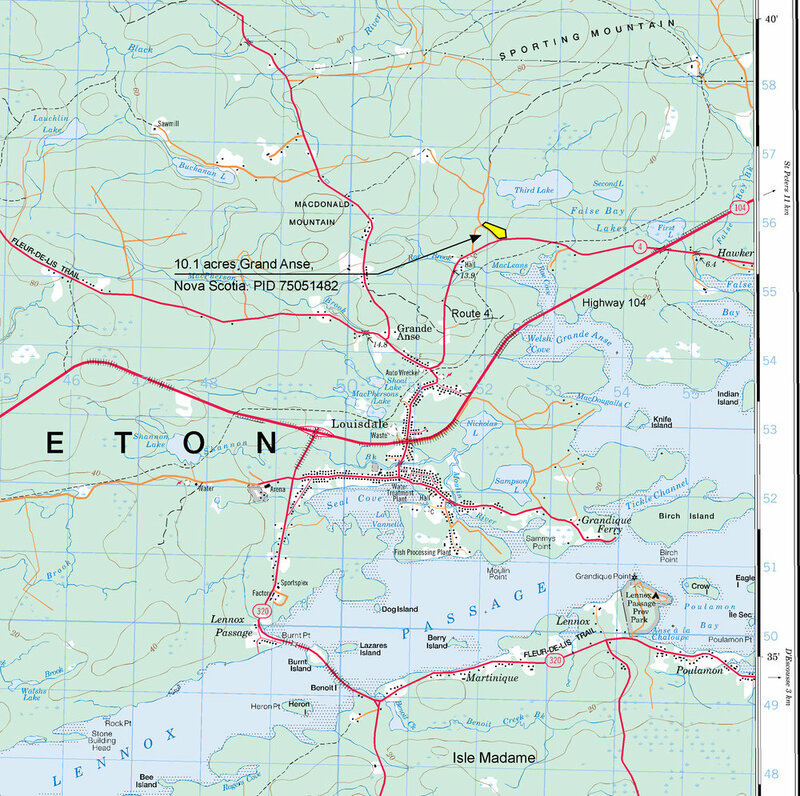 • St. Peter’s, Nova Scotia - Just 10 kilometers (6 miles) away - Grocery stores, pharmacies, liquor store, banks, instant teller, service stations, restaurants, coffee shops, gift and craft shops, and more! • Breathtaking Bras d'Or Lakes - Just 10 kilometers (6 miles) away - enjoy sailing, boating, fishing, and more! • Strait Area Hospital in Evanston - About 34 kilometers (21 miles) away. • Regional Airport in Sydney - About one hour away. • Halifax International Airport - About 2.5 hours away. Flights arriving from London UK, Germany, USA, Canada. • Northerly boundary measures 196.7 feet (59.9). • Northeasterly boundary measures 1,114.4 feet (339.7 meters). • Easterly boundary measures 343.8 feet (104.79 meters). • Southerly boundary measures 496 feet (151 meters) along Route 4. • Westerly boundary measures 1530 feet (466 meters) along Old Route 4. PRICE: Term Sale: $22,000.00, payable $1,480.00 down payment to secure the land and seventy-two (72) monthly payments of $285.00 each, and interest. Additional 10% discount if paid in full within 30 days: $19,800.00, if paid $1,400.00 down payment with order and the balance of $18,400.00 within thirty days thereafter.